Running from store to store was the only way in which you could compare fashion accessories and clothing in the past. This was sometimes done in the pursuit of a specific item, while in other cases window shopping was the name of the game. Whatever the case, this form of shopping was very inefficient and could take hours of time out of your busy day. As technology has progressed, so have our mobile devices’ ability to provide us with information on just about anything. The primary fuel of this trend is the mobile application, which aggregates and displays information or provides entertainment to its users. If you want to get in touch with your inner fashionista but do not have the time to go from one department store to another, then continue reading to find out about three excellent Android apps that can simplify your fashion shopping experience. It can be equally as difficult at times to find a great deal on select fashion accessories via the internet. While the store may take more time out of your day to visit, you often do not have to worry about the item in question being a counterfeit version of the real deal – this is more often the case on internet websites that promote special discounts for fashion accessories. The Snapette app for Android is a great way to avoid those pitfalls and still find great deals on handbags, shoes and more. You will be able to view items for sale at local boutiques and obtain directions to each location. High quality photos are often included to help make your window shopping experience easier, and the reviews section will let you know what others thought of this item. Available on Google Play, the Snapette app is a free download. 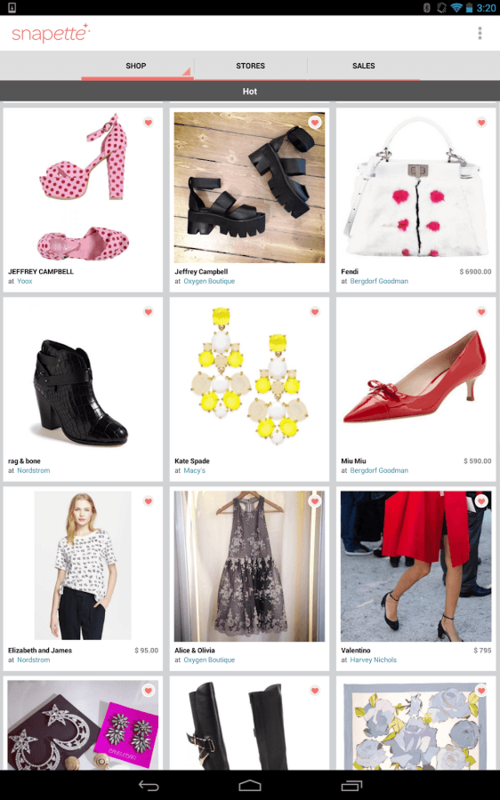 A social network designed for fashion lovers, Pose is a great Android app that will connect you with all of the latest in fashion. Users will be able to see what top fashion bloggers and celebrities are wearing, share their latest fashion choices with friends and other users of the network, and use the built-in style selection tool to follow users who have similar tastes as you. If you find ensembles and outfits that you enjoy, you can save these to your favourites section for later review. Available for free via Google Play, the Pose app may be one of the best tools out there for social fashion advice and inspiration. Last but not least, the Zappos app for Android allows users to shop from anywhere in the world via their mobile device. Currently a free download, users can take advantage of the app to search for a wide variety of fashion accessories, place orders and track shipments. Whether you want to browse men’s, women’s or children’s clothing, the Zappos app can oblige. Also included in the app is access to 24/7 customer service and their one-year returns policy. You can download the Zappos app via Google Play, sign up for an account and make your first purchases within minutes. How do online shopping sites offer better discounts than retailers?